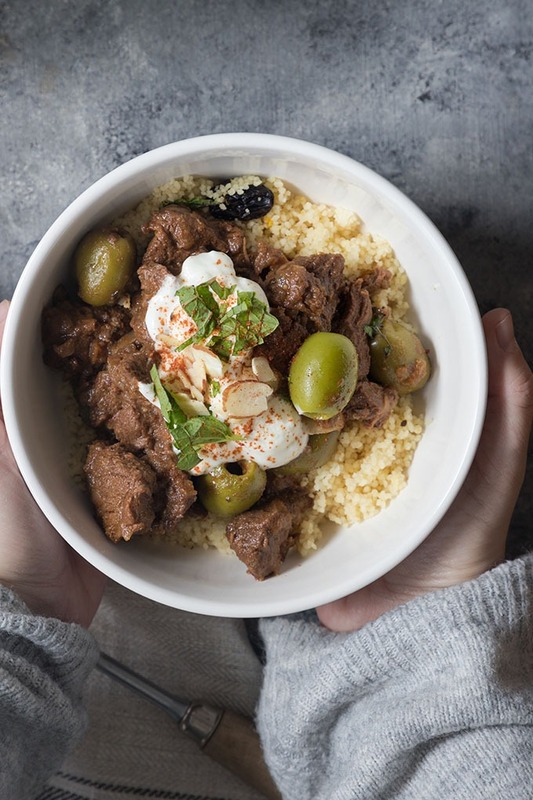 Moroccan Lamb Tagine – Combining two of my favourite foods and cuisines on the planet, this lamb tagine recipe is SO delicious, SO tender and SO easy to make! Tender and juicy lamb, slow cooked in a thick sauce, this recipe is so flavoursome and great for any occasion! OMG you guys! This recipe has definitely become my new favourite and I’m so excited to share it with you! I’ve been wanting to make a lamb recipe since I made my feta stuffed lamb burgers in the summer! Lamb would easily be my favourite red meat, and when I can find it in supermarkets here, I need to buy it immediately! I had a massive cook up the other day and invited 4 friends over for a dinner party to eat the leftover food! And let me tell you, this lamb tagine was gone in a second! Our friends absolutely loved it! It was one of those recipes, that makes you feel good inside after you taste it! This recipe leaves your heart happy, and your kitchen smelling absolutely amazing which, in my opinion, is a mark of an excellent recipe! This Moroccan lamb tagine was inspired by a combination of a trip to Morocco back when I was 21, and another Moroccan recipe that I’m waiting for a special occasion to bring out! 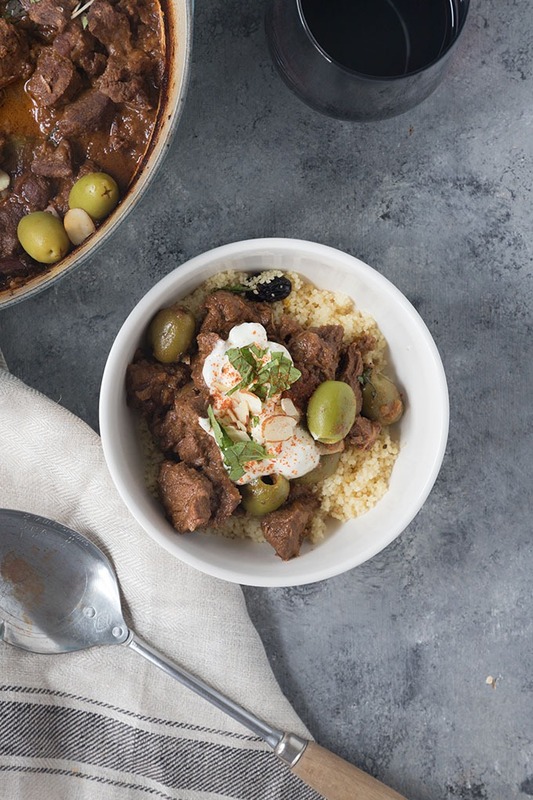 The flavour combination in this lamb tagine is outrageously good! It’s got a beautifully balanced combination of spices that really come out in the cooking process. What should I cook my lamb tagine in? Typically, tagine is cooked and served in a terracotta tagine pot, however, given that I was travelling for 6 weeks through Africa when I went to Morocco, bringing back one wasn’t an option! I’d love to buy one someday, but for now, I can use my Le Creuset Dutch Oven instead. If you do have a tagine, make sure it’s oven-proof. A lot of the decorative tagines I’ve seen are only meant to be used for serving, not for cooking in! If you were actually making it in a tagine as well, I would recommend stovetop cooking only. A proper tagine needs to come to temperature slowly otherwise it may crack. For this recipe, it’s easy just to follow the cooking directions for an oven-friendly Dutch oven. What type of lamb do I need? Ideally, lamb stew meat is the easiest option for this recipe, however, you could also use a boneless lamb shoulder or lamb leg and cut it into chunks to resemble stew meat. As this is a stew, a bone in chop or elbow cut wouldn’t be as good as plain stew meat. I find stew meat really breaks down beautifully and becomes SO tender rather than chewy. Where can I find lamb? I must admit, lamb has been a little tricky to find, especially trying to find stew meat, however, I was able to find some at our local New Seasons market in Portland. I also checked out our local butcher but he only carried large 5lbs boneless shoulders. The lamb stew at our local supermarket was around $8 per pound. My Australian and New Zealand friends, you’re probably not going to find it very difficult to get lamb! Some larger supermarkets may also carry lamb stew meat, but it’s always best to call ahead and ask first. 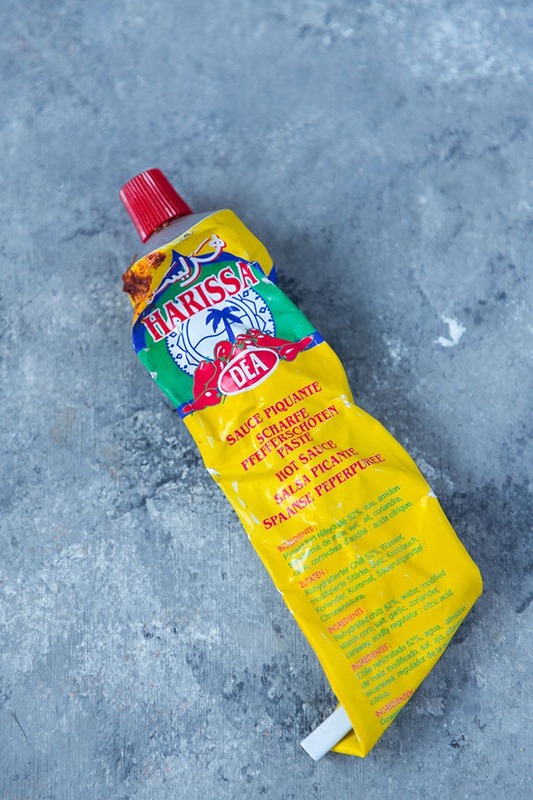 What is harissa paste and where can I find it? Harissa is one of my favourite North African spices! I’ve used it before on a LOT of my recipes, including my Harissa Roasted Carrots recipe for Christmas, and my North African Spicy Shakshuka recipe! I love the bold and spicy flavour of it, and unlike a lot of other chilli paste’s out there, harissa doesn’t have a super spicy flavour. Harissa paste again can be found in a lot of speciality gourmet supermarkets and the paste usually comes in tubes that you can find on shelves. One opened, I keep mine refrigerated and it lasts a long time if stored properly. The harissa flavour is just definitely not overwhelming in this recipe, so if you’re worried about it being spicy, don’t! It’s very mild. On the other hand, if you want more spice, feel free to add more than the recipe states. You can also get dried harissa powder, I have not tried it for this recipe however so I cannot guarantee it will yield the same results as harissa paste. 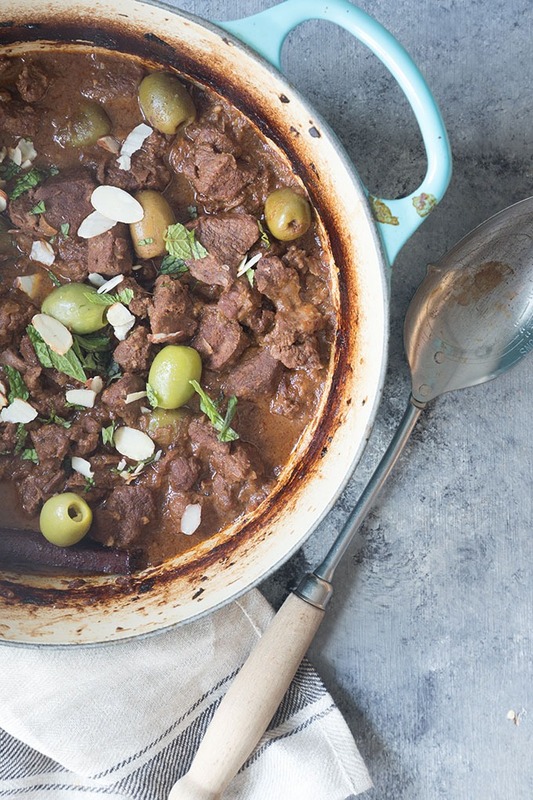 What can I serve this Moroccan Lamb Tagine with? Couscous. And not just any couscous, couscous that is cooked in fresh orange juice and made with raisins. The lamb tagine itself is not sweet, so it needs that element of sweetness that you find in a lot of Moroccan dishes. This comes from the raisins that you’ll use in the couscous. What else do I need to know to make this dish? There isn’t much else to this dish, although I will say, this is not a quick dish to make. This is one of those glorious slow-cooked dishes that require little attention, but a lot of love and patience. For the best flavours, the meat should be marinated overnight in the spice mixture so that the flavours are able to strengthen overnight. Other than that, this dish starts on the stove, then gets transferred to a slow oven. I cooked mine for 2-2 1/2 hours until the majority of the liquid had evaporated leaving you with a delicious thickened sauce. The meat should be super tender and almost falling apart – you should be able to break it up with a fork. 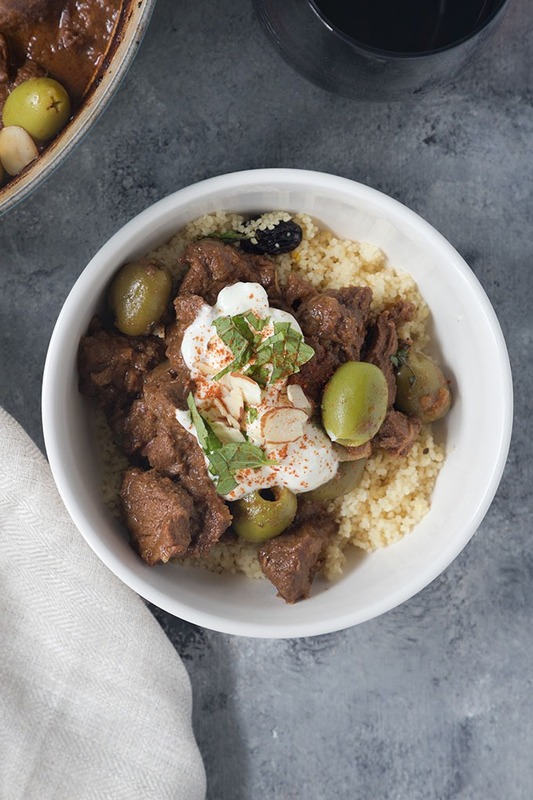 After cooking, I serve the Moroccan lamb tagine with extra olives, some finely chopped mint, a handful of flaked almonds and a dollop of Greek yogurt with a sprinkle of harissa powder to serve the purpose of making it look pretty! Serve on top of the couscous, and feel free to double the batch if you want more than 4 servings. 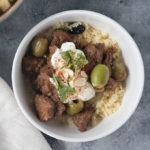 This Moroccan lamb tagine is so, SO good for fall or winter entertaining when you’re looking for something a little unique that feeds a crowd. The flavours are bold but fresh, and the tenderness of the meat is to die for! So happy tagine cooking! And happy fall (or spring to my southern hemisphere lovelies!). This lamb tagine recipe is SO delicious, SO tender and SO easy to make! Tender and juicy lamb, slow cooked in a thick sauce, this recipe is so flavoursome and great for any occasion! Combine ground spices, salt and pepper and harissa with the lamb in a large bowl and mix together until the lamb is covered with spices. Heat the olive oil in a large, oven-proof Dutch oven over medium to high heat. Add the cinnamon quill to infuse the oil and let it sit for 1-2 minutes, stirring occasionally. Add the onion, and fry for 3 minutes until it starts to soften. Add the garlic and ginger and fry off for 1 minute or until fragrant. Add the lamb, and cook for 3-5 minutes, until the lamb is just starting to brown. If it gets too dry, add a dash of olive oil. Pour in the red wine to deglaze the pan. Use a wooden spoon and gently scrape the bottom of the pan to release the flavours into the wine. Add the beef stock, lemon zest, and about half of the green olives. Place Dutch Oven in the oven and slow cook for 2 - 2 1/2 hours until the liquid starts to evaporate leaving a thick sauce. If it is drying up too quickly, add a dash of stock or water. You don't want the stock to fully evaporate so that the lamb burns. Before serving, stir through the lemon juice and add the remaining green olives. Place the couscous, raisins and salt and pepper in a medium-sized bowl. Heat the water and orange juice in a small saucepan until it just starts to boil. Pour the water over the couscous, and set a plate over the top of the bowl to allow the couscous to absorb the water. Leave the couscous for 5-8 minutes. Fluff up the couscous using a fork and place into a separate serving bowl. Start by scraping the top layer, then remove each layer to ensure all the couscous has been broken up. Serve couscous on plates, and top with the lamb tagine. Garnish with a little bit of mint and some flaked almonds (optional). I love a good Moroccan lamb tagine. Lots of flavor. And that orange couscous sounds so yummy too. 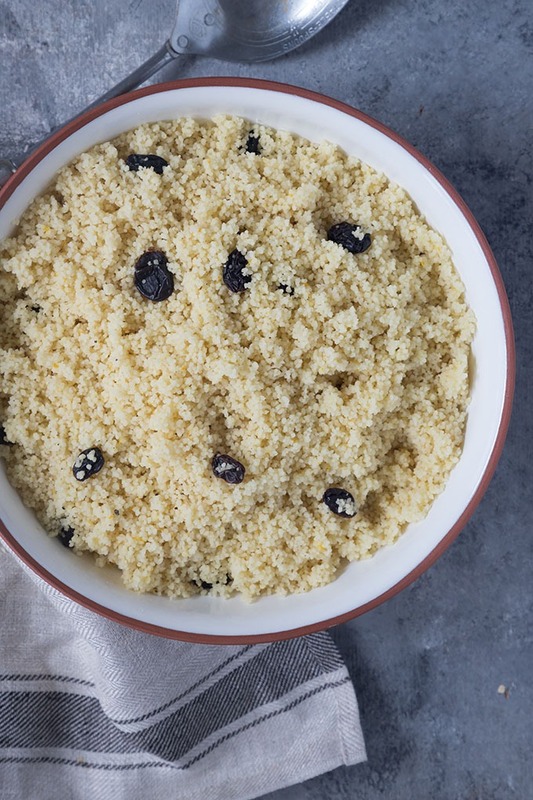 the couscous is a great addition because it sweetens it up ever so slightly! One of the great things about travelling to different countries is trying out different foods, and then bringing those ideas back home with you to make yourself. This is a very tasty sounding dish, ideal for Autumn days. absolutely! that’s my excuse for travelling ha ha! it is so cozy and delish, I adore it! I love vegetarian tagine and I am glad that middle eastern/Moroccan American restaurants serve it for the vegetarians like us. Lucky you to be traveling and experiencing the food first hand. vegetarian tagine is beautiful too! thanks Sonal! I envy you travelling to Morocco. I’ve always wanted to visit there and the cuisine like this dish is one of the many reasons why. Great job! thanks Pam! morocco was one of my favourite places i been! This is a great looking tajine! Lamb is definitely my favorite meat when it comes to slow cooked stews so this one is definitely on the list for trying! thanks Kiki! it’s so easy because you basically just throw it in and wait until it’s done! This looks amazing! I don’t cook a lot of lamb, but my husband loves it, so I really need to give this a go! lamb is so so good you’ll have to try it! Sounds absolutely wonderful. I have never tried my hands at Moroccan cuisine but this recipe is so tempting. I am generally not very drawn to North African cuisines as I have a low tolerance to spices, but I feel like I need to overcome this and become more bold with flavours. This would be a very good starting point! North African cuisine isn’t overly spicy compared to Central American or Thai for example, that’s why I love it! This dish isn’t really spicy at all but so bold in the flavours! thanks so much Marco, I hope you do make it! Love all the flavours in this dish. Great recipe! thanks, Courtney! this dish leaves the house smelling amazing!!! the recipe looks absolutely amazing. What makes it even more interesting is that its an amalgamation of such amazing flavors. I have tasted veg tagine before but will be glad to try it with lamb. thanks for the lovely share. vegetarian tagine is also delicious! I love it! I’m a big fan of tagine dishes like this! Hard to find lamb, a bit surprised. Pretty easy to come by here in the Boston area. really?! It’s hard to get here in Portland for some reason! It’s easy back in Australia where I’m from, but that is so good to know you can get it in different states! I’ll have to make some more recipes with it! I have been wanting to try making a lamb dish. I have never tried it. The flavors here sound absolutely amazing! lamb is amazing!!! it’s my favourite red meat! The hubs and I love to try new recipes that are from regions of the world we’ve never been to. Plus, I know this recipe is a keeper because of the ingredient list which tells me how much flavor and love is in this dish! the flavour is insane it’s amazing how much you can get from some spices! My goodness what a meal! All the flavors in this dish…be still my heart! I want to dig right into this. I love the Moroccan flavors and spices…definitely want to give this a try! thanks Tammy! the flavour combination is beautiful together! I love lamb, but don’t eat it nearly as much as I’d like. I’m not really an olive fan, but I think this dish would be just as good without them. Or maybe even cook with the olives in it, and then remove. Thank you for sharing this! you could totally omit the olives and add raisins instead for some sweetness! olives are traditionally used in Moroccan food, but so are dates and raisins! If you substitute raisins, I would omit the raisins in the couscous otherwise it may be too sweet! Lamb and couscous is always a winner. Sounds like some wonderful flavours in this. I have never had this dish. But I always appreciate learning and interested in other dishes from other countries. it’s beautiful and really just a fancy way of saying lamb stew with some spices! Yum, this lamb looks amazing!! The perfect comfort food on a cold fall day! thanks Sam! it’s perfect for a fall or winter dinner party! My husband LOVES lamb. This looks so succulent and delicious… I can’t wait to try it out! I’ve never tried making anything Moroccan before. Moroccan is one of my favourite cuisines!! it’s just gorgeous and the lamb is so tender! Oh this sounds and looks fantastic. So flavorful and so comforting. Perfect for Fall and winter. I love the addition of harissa and olives. Lamb is my fav so I’ll be making this for sure. I do hope you make it! it’s just gorgeous, and the smell in the house is insane!!! its been so long since ive had moroccan food, you have my stomach growling! us to! We used to have some amazing African restaurants back in Australia!